PRESIDENT Edgar Lungu has urged politicians and citizens to continue preaching peace and reconciliation to help the country achieve prosperity. 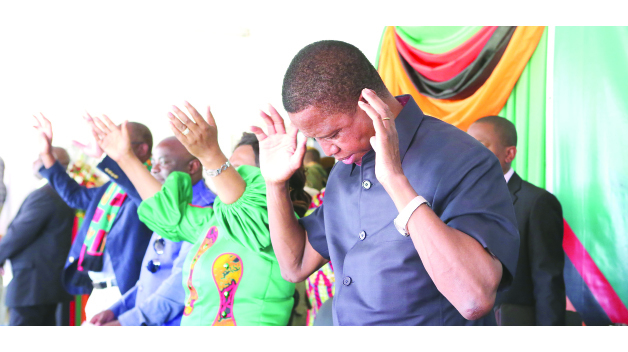 President Lungu said this at yesterday’s Kitwe’s Nkana stadium gathering where he joined thousands of worshippers from different denominations and callings to commemorate this year’s National Day of Prayer and Fasting. Mr Lungu said he would not be ashamed to seek the face of God whenever the country faced a crisis. “I did not want to speak today… but later on, I convicted by God that there is nothing to fear because before I became a politician, I was a Christian. We should not be ashamed to preach peace and reconciliation as well as turning to God in critical moments,” Mr Lungu said. The President, who quoted John 1 verse 1, said the reason he continued reaffirming October 18 declaration as a Day of Prayer and Fasting was his reverence of God as a source of spiritual nourishment. He said he drew inspiration from Biblical accounts of kings and rulers who turned God every time they were faced with calamity. Mr Lungu said since 1991 when the second republican President Fredrick Chiluba renewed the country’s belief in God’s divine intervention, all the past presidents, including himself had continued reaffirming the country as a Christian nation. He said according to biblical instructions, repentance was cardinal for people to enjoy God’s favour, hence the need for a complete reflection. “This day is there for us, to spend a moment to have a complete reflection and the need for repentance while forging a new chapter,” the President said. This year’s event was staged under the theme ‘Repentance: Promoting Peace and Reconciliation; Consolidating National Unity in Diversity’. The occasion was characterized by gospel song and dance in which the president was happy to join, drawing applause from the gathering. Copperbelt Minister Bowman Lusambo who was among notables encouraged President Lungu to continue upholding the country as the Christian nation. “You (President Lungu) should not be detracted because what you are doing is not for you but for God. 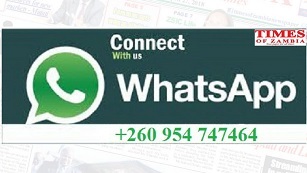 There is time for everything and your duty is to uplift the standard of living of our people,” Mr Lusambo said.